Let’s face it, for the fitness lovers; kettlebells are the new must have toys. Everybody is talking about them. So, I finally bought into the craze and let me tell you: while my energy and physical fitness level are thanking me, my muscles are flipping me the bird. I. Am. Sore! And, I am sore because of Lorna Kleidman’s “Body Sculpting with Kettlebells for Women.” Before I get into talking about my experience thus far, let’s dive into the book itself. 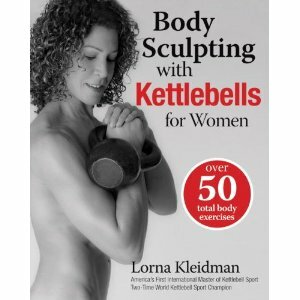 I spent a solid week researching and reading reviews on several kettlebell books before settling on Lorna Kleidman’s “Body Sculpting with Kettlebells for Women.” It had raving reviews and I understand why. It begins as any good fitness book should: explaining why the specific workout is beneficial, offering helpful tips on maintaining good nutrition, and explaining the essentials of kettlebell safety while including key terms and the proper form necessary for completing the three programs: silver, gold, and platinum. It also individually breaks down the over 50 total body workouts for a step by step guide to ensure proper form and prevent injury. The programs themselves are quick, fun, and effective. They each begin with a warm up (which the book explains in detail), contain 3 sets of about 4 to 5 individual exercises, and end with a cool down, (which the book also explains in detail). Each program is 6 weeks in length and contains 4 workouts to be had on Monday, Wednesday, Friday, and Saturday. The Saturday workouts are shorter and more intense workouts called super-sets…not that they aren’t all intense. However, the gold and platinum programs feature more super-sets throughout the week. Now that you understand the basic breakdown of the book, I’ll describe my experience so far. I’m just starting week four of the silver program. After explaining that I hadn’t ordered inappropriate things from Amazon to a shocked and nosy family member who saw a book featuring a half naked lady, (that will teach you to open other people’s boxes!) I got to test out the over 50 total body exercises the book promised. Okay, every story has a moral and this one is no different. Moral is: if you are a beginner or even experienced kettlebell user, I would highly recommend getting this book for a solid program that produces results and makes working out much more enjoyable. Now, I know the book says it’s for women only, but I think men could also get some great full body workout ideas from the book, just using a different weight. Give it a try and I hope everyone enjoys the program as much as I am. This entry was posted in Fitness/Workouts and tagged body, circuit, kettlebell, sculpting, training, women. Bookmark the permalink. Thank you for your review, I’m so excited to know of your progress!! Please keep me posted and of course let me know if you have any questions about the movements or the programs. My DVD series will be out this spring, so get yourself ready for some new challenges! I love your great web page! You should get part in a competition for one of the finest websites on the web. Are you planning to publish some extra about it? Bless you for blogging this. I have been checking for it awhile right now. Thank you for the nice comments! I may post some extra on the kettlebell program as I continue through to the harder programs. Keep checking in! As for your website, I like your posts on interval running. I don’t care much for running long endurance because I tend to get bored. I do, however, enjoy interval running. It mixes it up enough to keep my interest so I relate to your articles. Keep it up!